Originally titled Enemy Starfighter during development. 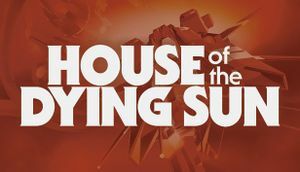 Due to a bug when using an administrator account on Windows 7, data is stored at HKEY_CURRENT_USER\Software\AppDataLow\Software\Marauder Interactive, LLC\House of the Dying Sun instead. 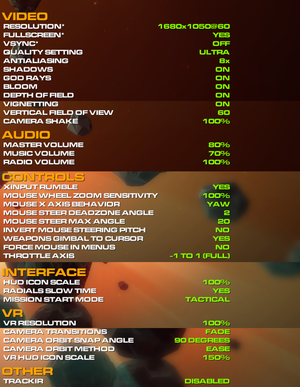 Only dual-analog gamepads and keyboard/mouse are officially supported. 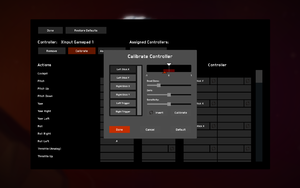 For issues with HOTAS controllers see the official troubleshooting thread. Radio chatter is not subtitled. Run as administrator to get it to work with the TrackIR driver. Press ~ (or ö on QWERTZ keyboards) in-game to open the command console. For a list of available commands write cmdlist. To activate a command permanently, go to <path-to-game>, create a folder called cfg and write it into a file called autoexec.cfg. To unlock everything in the game, open the console in the main menu and type cask.override sc1@maCh into the command line. Note that this will disable achievements until the campaign is reset. ↑ 1.0 1.1 File/folder structure within this directory reflects the path(s) listed for Windows and/or Steam game data (use Wine regedit to access Windows registry paths). Games with Steam Cloud support may store data in ~/.steam/steam/userdata/<user-id>/283160/ in addition to or instead of this directory. The app ID (283160) may differ in some cases. Treat backslashes as forward slashes. See the glossary page for details. "*NOTE: This game supports rebinding controls, but only dual analog gamepads and keyboard & mouse modes are officially supported." This page was last edited on 13 April 2019, at 10:30.